You must set your Time Zone and Item Level to use scheduled listings. Scroll down to Timezone and select your time zone from the dropdown. Set the Item Level toggle to "On". Once the time zone is set and eBay item level is on, follow these steps to set up a scheduled listing. 1. Click on the SureDone Editor. Once there, you may edit an item to set the schedule, or choose it when adding a new item. 2. Once you are in the item, scroll to the eBay section. Here you will see the Scheduled Listing toggle. 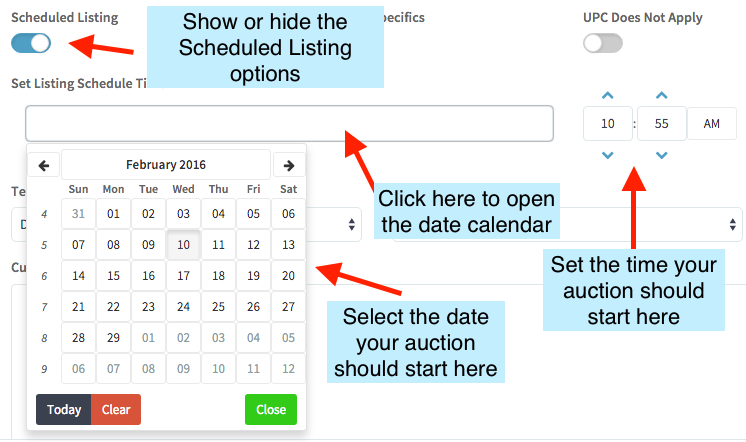 Set the Scheduled Listing toggle to on, and the Set Listing Schedule Time field will be shown. Click in the Set Listing Schedule Time field and a calendar with a time option will be displayed. Schedule the time (hour, minute, AM and PM) of the listing using the hour, minute, and AM/PM field fields beside the Set Listing Schedule Time field. Note: If you attempt to schedule a listing in the past, it will instead be listed once it's submitted. Also, you can’t go into a listing that is already live and alter the Scheduled Time. BULK LISTINGS: You may use the header ebayscheduletime and the entry format is MM/DD/YY - HH:MM. The time format is 24-hour and uses the time zone set in your account under Settings > General. To learn more see our guides for Bulk Uploading.